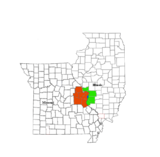 Marion County comprises the Centralia, IL Micropolitan Statistical Area, which is included in the St. Louis- St. Charles- Farmington, MO-IL Combined Statistical Area. Initially a strongly Democratic anti- Yankee county, Marion County has undergone two transitions. Between 1912 and 2004 it was a perfect bellwether apart from the Catholicism-influenced 1960 election when substantial anti-Catholic voting by its largely southern white population caused it to support Republican Richard Nixon. Since the beginning of the twenty-first century, strong opposition to the Democratic Party’s liberal views on social issues has transformed the county into a powerfully Republican one,  with Hillary Clinton receiving a vote share over twelve percent smaller than any pre-2010 Democratic presidential nominee.